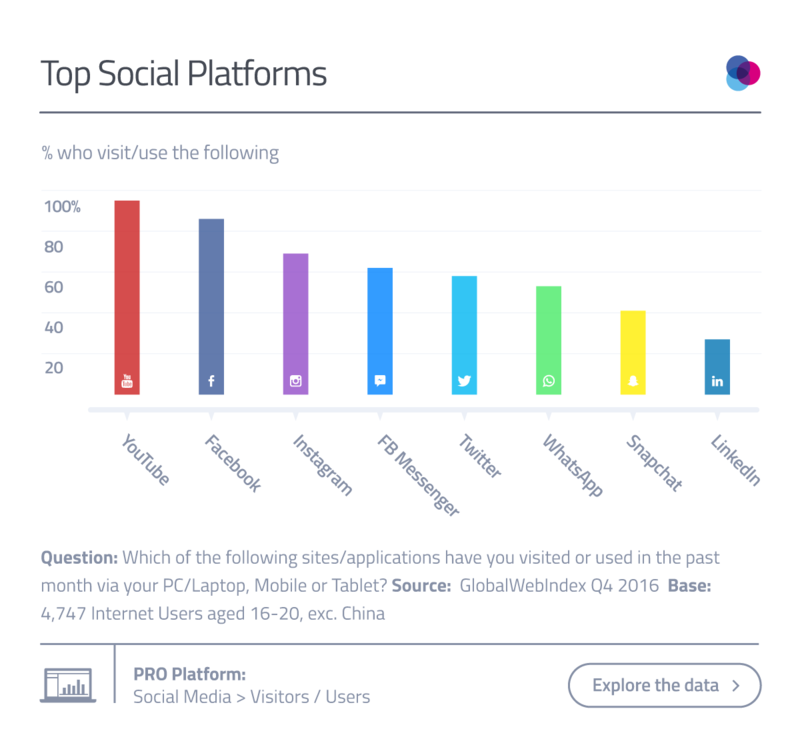 In this post, GlobalWebIndex's Senior Trends Analyst Katie Young talks about Generation Z, and their potential receptiveness to influencer marketing. Millennials have long been the focus of marketers’ attention and plenty of research has been done to try and better understand these often-perplexing consumers. But as Millennials enter the next stage of their lives, it’s time for marketers to now start paying attention to the new kids on the block – Generation Z – who will soon be wielding their spending power and influence. Putting tens of millions of people into a generational archetype will undoubtedly create some big generalizations, but a 16-year old in 2017 really does live in a different world to a 16-year old in 2007. Whereas Millennials will remember the arrival of Facebook and a time before smartphones, Generation Z are digital natives, born into a high-tech and highly-networked world. And there are some defining attributes and behaviors of theirs that marketers can’t afford to ignore – one of them being their potential receptiveness to influencer marketing. Unlike their Millennial counterparts, Generation Z (here defined as internet users aged 16-20) have always known a crowded social space. Glance at their top social platforms, though, and it’s their love of YouTube that really stands out. Virtually every single Gen Zer is visiting/using the video site each month (95%), giving it a reach like no other. This nicely highlights the new role social networks have as hosts of entertainment content. Whereas teenage Millennials were using social media to update their statuses and to see what their friends were up to, today social networks are full to the brim with content like videos and articles - where people go to watch TV shows/clips and keep up with their favorite celebrities, as well as their friends. Importantly, though, this creates new opportunities for brands – in particular, the opportunity for influencer marketing. Whether its Unilever employing Zoella for its ‘All Things Hair’ YouTube Channel, or Kim Kardashian snapchatting her Airbnb accommodation, there’s no shortage of brands using this form of brand promotion. And GlobalWebIndex’s data points to this generation being the most receptive of all. First and foremost, Gen Z are more likely to be influenced than other generations, and they’re also big on celebrities. Over 40% say they’re easily swayed by the opinions of others and they over-index considerably for following celebrities on social media. Vlogs have made a real impact too: 57% watched one in the last month, with a fifth saying they watch celebrity or vlogger videos on YouTube. 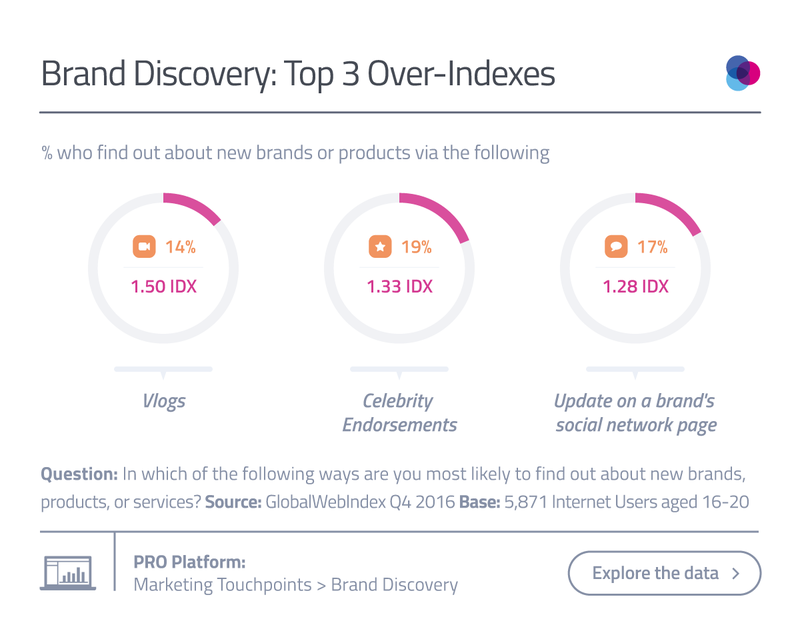 And when we ask Gen Zers where they tend to hear about new brands/product, it’s certainly relevant that celebrity endorsements and vlogs see the biggest over-indexes of all. It’s really not hard to recognize the potential of influencers to sway them towards certain products, then. Generation Z are a marketing-aware generation who have been marketed to their whole lives, not just via linear advertising but also through the likes of native advertising and sponsored social posts. They’ve always had endless information at the touch of a button and are accustomed to quickly filtering through everything to determine what is relevant. It’s up to brands to communicate and engage them with compelling and snackable content. An influencer sending out a brief and personal message to their following on Snapchat or Instagram Stories would undoubtedly fit the bill here. 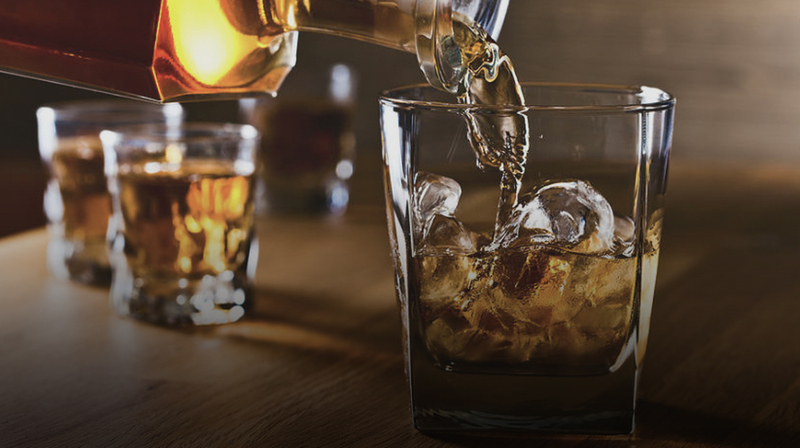 The highlights from our Discerning Drinker event, looking at the future of alcohol marketing.